Hey everyone. Lately I decided to make a short video to have an excuse for learning shaders, cinematic lighting, matinee and etc. So I picked famous Alien Queen as my test object and I thought I'll share what I've come to so far. I've started with original model from old game AVP as it would be too long to model it all out from scratch with high poly and lowpoly. However reworked textures a bit, made a custom shader to have more crisp details and tessellated the whole model for more smooth shapes. Also I completely rerigged it so I could animate it for a test preview. Looks simply amazing. 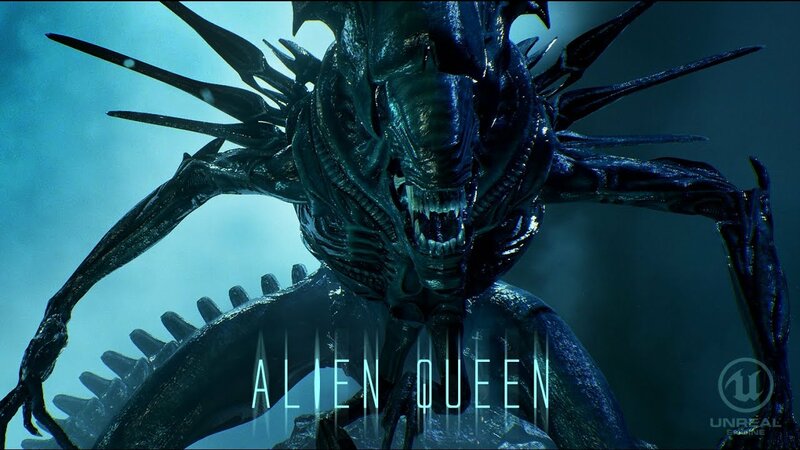 Only real input I have is it would be cool to have the drool effects/breath fog around the Queen's mouth, but that is just a nitpick. ****! Nice work, this looks fantastic! Already better than colonial marines haha nice work. It looks very organic, great job on those shaders! ZenrokStudios - agreed, I'm working now on particles to make at least some drool. I'm not sure it is possible to make a nice looking saliva in unreal engine, but drooling could work out. And yes some smoke air coming from mouth would be awesome. The cinematic effects give it a movie quality. Looks beautiful ! this look amazing! well done. If you want drool, you can try a translucent shader with refraction, roughness, and subsurface scattering. Maybe make an interesting 3D mesh for that, and attach it to sockets around the mouth. I think there is a new feature coming that lets you knock down the pixel resolution behind translucent objects, so if that comes with a blur function, then you're set! Also, I feel like you need god rays. Epic god rays. I mean UDK Epic god rays, like ridiculous rays casting from at least one directional light. I think rays only work on directional lights, now. But you need them. Also, you can set translucent foggy materials to cast shadow, put a normal map on them, and get more depth. Hly ****! that looks absolutely amazing! Well done! That is just beyond amazing. The lighting and shadows. The model and shaders are amazing man, I honestly have no crits besides I wish it was longer.